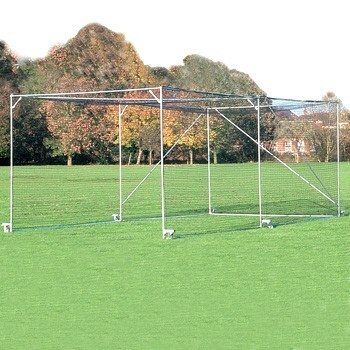 A mobile steel cricket cage which can be used either on the square or around the ground. Uprights, top rods and base rails are all manufactured from 33.7mm diam tubular steel which is fully galvanised. The components are held together with kee klamp joints and the cage moves easily on six rubber-tyred swiveling wheels – one per upright. Size: Single Bay – 3.66m wide x 7.32m long x 2.74m high. The cage is supplied in kit form complete with 2mm thick 50mm square mesh black knotted cricket netting to the back and wings with a separate roof net. (Ties not included). *Our top rods are bolted as an additional safety feature.